The words that sparked the resistance movement to rally in support of Sen. Elizabeth Warren when McConnell tried to silence her now apply to Sally Yates. If you remember, she is the woman who served as the Deputy Attorney General in the Obama administration and was initially asked to stay on as the Acting Attorney General for Trump until he fired her for refusing to defend his Muslim travel ban. Or was there another reason? [Four days earlier], Yates warned the White House that the statements made by Michael Flynn about his contacts with the Russian Ambassador were not true and could potentially be used as blackmail against him, a warning that the White House chose to ignore until the information became public and Flynn was fired. Yates is now eager to talk to congressional investigators about those developments. The Washington Post reports that the White House has “sought to block” her testimony. 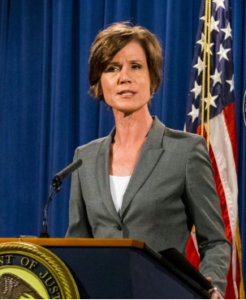 According to letters The Post reviewed, the Justice Department notified Yates earlier this month that the administration considers a great deal of her possible testimony to be barred from discussion in a congressional hearing because the topics are covered by the presidential communication privilege. A White House spokesperson pushed back against the Post’s reporting, calling the article “entirely false,” and pointing to the specific text of the official correspondence. But you will recall that the open House Intelligence Committee hearing that was scheduled for Monday, in which Sally Yates was prepared to testify, was abruptly cancelled last Friday by the committee’s chairman, Rep. Devin Nunes (R-Calif.), without notifying any of his colleagues. Today we learned that happened on the same day that Yates’ lawyer responded to the attempts by the White House to silence her. That same day, House Intelligence Committee Chairman Devin Nunes announced he would not go forward with the public hearing that was to feature Yates’ testimony. One of the cliches to emerge from the Watergate scandal was, “It’s not the crime, it’s the cover-up.” With the recent activities of Rep. Nunes and now this, it is increasingly looking like the White House is engaged in a cover-up. Regardless of what evidence is available for the probe into whether or not the Trump campaign colluded with the Russians, they are sure acting like they have something to hide. We don’t know how important Yates’ testimony will be. But obviously she is determined to persist, even after being warned. So if or when she is able to testify in an open hearing, the White House just ensured that it will be considered yuuuuuge. At [this] point, the White House, and its hapless Night Stalker Devin Nunes, folded like cheap suits and canceled the hearings entirely. The administration really had no choice. They could let Yates testify, in which case anything could happen. Or they could go to court and stop her, and look even more like they’re trying to bury what she knows. (Maybe they could have sent federal marshals into the committee room to stop her. That would’ve been great TV!) Or they could duck and let Nunes take this in the face, which is pretty much what they did, because it’s always Someone Else’s Fault with this bunch. The request for recusal marks a critical split between Schiff and Nunes, who had worked closely on the House investigation into ties between top aides to the campaign of President Donald Trump and Russian officials. It comes just hours after CNN reported that Nunes visited the White House grounds one day before going to the President with evidence that his transition aides’ communications were picked up in surveillance by US intelligence. “This is not a recommendation I make lightly, as the chairman and I have worked together well for several years; and I take this step with the knowledge of the solemn responsibility we have on the Intelligence Committee to provide oversight on all intelligence matters, not just to conduct the investigation,” Schiff said Monday. Somewhere out there is the independent counsel that we need to get to the bottom of this murk and mire. I hear Sally Yates might be looking for work. Sally Yates will eventually testify before both the House and Senate Intelligence Committees, and no doubt she is a cooperative witness with the FBI and intelligence agencies. The White House will not be able to silence her for long. Previous articleKansas is a cautionary tale for Arizona: pigs do fly – again! the one who should have kept silent was evelyn farkas. the information nunez got from white house is march 2 2017 interview she did on moring joe about obama administration spying on trump and his team. also 2011 and later obama loosening rules like 12333 on unmasking political opponents so rice lynch brennan and others good gather intelligence on trump and his team. watch march 2 2017 interview of evelyn farkas on morning joe. interesting as mr spock says.